Notting Hill Carnival is my favourite event of the year. But, it's certainly not for the feint of heart. 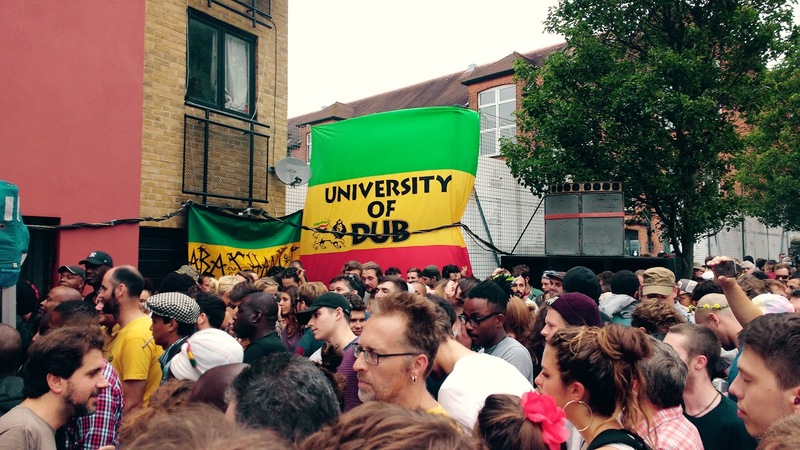 If society were to collapse and everyone decided to throw a massive street party instead, it would look like Notting Hill Carnival. Notting Hill Carnival is nothing like a normal music festival and there is definitely a few things to keep in mind to ensure a good time. Here are some of the tips that I've picked up over the past decade that hopefully will help you get the most out of this unique event. Seriously, it's busy. You definitely need a lot of patience and stamina to make your way through the sea of people. If that sounds like a terrifying prospect, chill at home and watch the coverage that Boiler Room are doing instead. This is probably the most important one in my opinion. 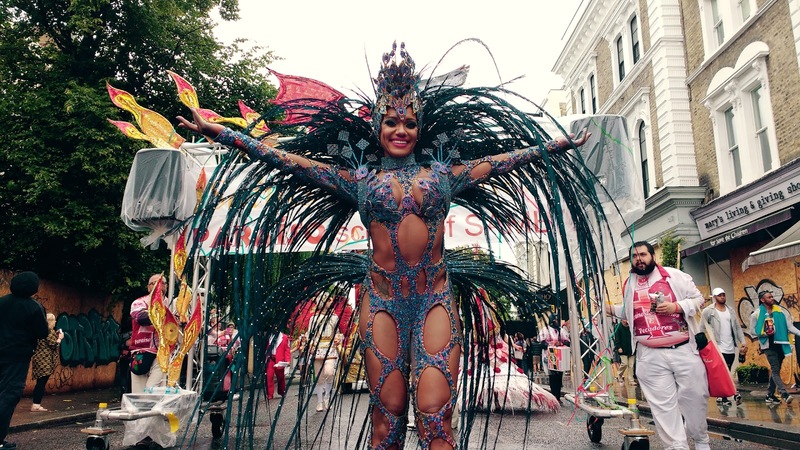 The Carnival starts at 9am and finishes at 7pm. As already mentioned, it gets really busy by 1pm. After which you'll find that it will take a long time to move between soundsystems (you could be stuck in busy crowds for up to an hour while trying to get from A to B). So aim to be at the carnival by 9am if at all possible. I know you may be hungover from the night before, but it's worth it so that you can get a chance to explore some of the smaller soundsystems before it gets too crowded to move. Also, the carnival doesn't go on till too late so it's a good way to make the most of the day. If you want to avoid getting lost and walking in large crowded streets the whole day, get yourself a decent map. Time Out has the best map in terms of logistics, listing the carnival route, all the sound systems, toilets and other useful stops. Do yourself a favour and download an offline version to your phone as the signal can get a bit patchy out there. Buy all of your booze, baccy and other bits the night before. The shops around the carnival get really busy and run out of stock quickly. The shops inside the carnival ramp up their prices quite a bit and the queues are horrendous. You really don't want to be wasting 45mins queuing to buy a lighter. Pack a bag stocked up with what you need. Also, don't be one of those boring people drinking a posh craft beer or a bottle of wine. It's Red Stripe, or go home. The Carnival route itself is only a small part of it. 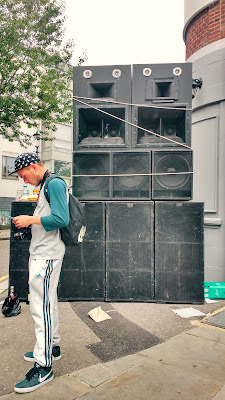 For me, the best part is the soundsystems. Time Out (again) has a good round up. Just remember, you won't be able to visit them all, so don't bother. Pick three or four that you definitely want to check out and have a rough plan to visit them. Then you can chill and enjoy wandering around, discovering some of the hidden ones along the way and also check out the Carnival route itself. My picks? Aba Shanti-I, Pineapple Tribe and Disya Jeneration. The food in the Carnival is fantastic. Don't forget to take an hour out of the soundsystems to grab some. Also, don't be one of those boring people and eat bloody sushi or something. It's Jerk Chicken, or go home (unless you're vegetarian, in which case, have a corn on the cob). Start a WhatsApp/Messenger/Whatever group with your mates and keep in touch that way. GPS will still work so use that if you get lost. If you're lucky, you might get some signal too. 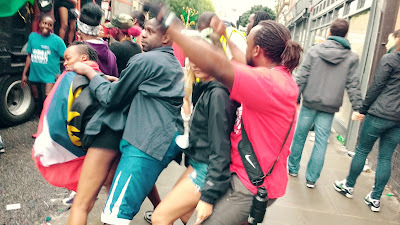 If you get hopelessly lost and can't find your mates, don't worry, enjoy the rest of the Carnival solo and soak up the atmosphere. In the wise words of Robocop, "stay out of trouble". Leave the agro at home and keep an eye out for your mates. Use common sense and carry only what you need. There's a large police presence so reach out to them if you need help. They're there to make sure you're safe! Oh and on the subject of the Police, they are also super handy for finding the locations of toilets. I know it's an awful cliché, but that really is the most important thing. See you there!